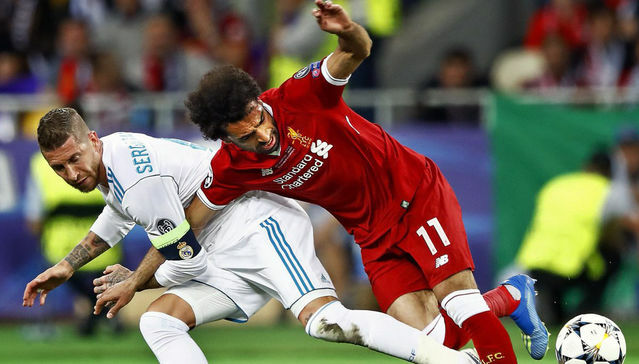 Real and Spain defender Sergio Ramos has come out to clear the air on his bizarre tackle on Reds’ Mohamed Salah in last season’s Champions League final in Kiev. Ramos, 32, who wore the armband for Spain against England at Wembley last night, said that he had never intended to hurt Salah who dislocated a shoulder in the incident after 25 minutes and later left the pitch in Kiev in tears. Jurgen Klopp later accused Ramos of flooring Salah “like a wrestler”. “I’m not really concerned about that. I never wanted to hurt an opponent on the pitch, of course, so my conscience is really clear about what I did that night. I’m not going to be affected by that at all.